A team of physicists has proposed a way of teleporting energy over long distances. The technique, which is purely theoretical at this point, takes advantage of the strange quantum phenomenon of entanglement where two particles share the same existence. The researchers, who work out of Tohoku University in Japan, and led by Masahiro Hotta, describe their proposal in the latest edition of Physical Review A. Their system exploits properties of squeezed light or vacuum states that should allow for the teleportation of information about an energy state. 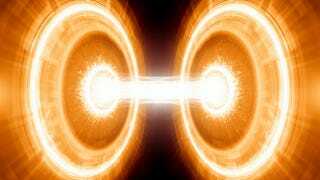 In turn, this teleported quantum energy could be made useable. Unlike teleportation schemes as portrayed in Star Trek or The Fly, this type of teleportation describes entanglement experiments in which two entangled particles are joined despite no apparent connection between them. When a change happens to one particle, the same change happens to the other. Hence, the impression of teleportation. Physicists have conducted experiments using light, matter, and now, energy. According to Hotta, a measurement on the first particle injects quantum energy into the system. Then, by carefully choosing the measurement to do on the second particle, it is possible to extract the original energy. Back in 2008, Hotta, with another team, first devised a theory for teleporting energy based on taking advantages of vacuum states—theory suggests they are not truly empty, instead there are particles in them that pop in and out of existence, some of which are entangled. While interesting, the theory suggested that teleporting energy could only be carried out over very short distances. In this new effort, Hotta et al have found a way to increase the teleportation distance by making use of a property known as squeezed light which is tied to a squeezed vacuum state. Quantum mechanics laws limit the ways that values in a system (such as a vacuum) can be measured—physicists have found however, that increasing the uncertainty of one value, decrease the uncertainty of the value of others—a sort of squeezing effect. When applied to light, theory suggests, it leads to more pairs traveling together through a vacuum, which in turn leads to more of them being entangled, and that the team suggests should allow for teleporting energy over virtually any distance. Moving forward, the researchers want to put their theory to the test in a lab. Hotta hints that his team is in the process of doing just that. Interestingly, this work has implications to a number of related fields, including black hole physics and the quantum theory of Maxwell's demon. Find out what Maxwell&apos;s Demon is, and how some physicists are channeling it. To learn more about this, I recommend you read this MIT article from 2010, which covered an earlier version of Hotta's theory.